Start a special someone’s birthday celebration with our It’s Party Time! 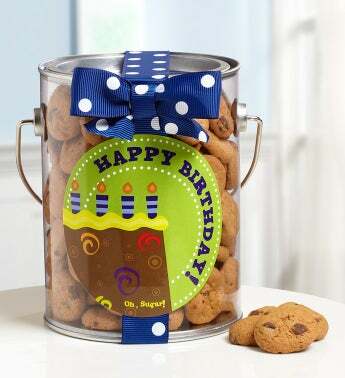 Birthday Cookies in a Can. It’s a resealable paint can filled with the tastiest mini-chocolate chip cookies they’ll ever eat, tied with a bright blue ribbon covered in white polka-dots!